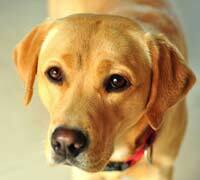 Labrador Retriever has consistently ranked as the most popular purebred dog in the United States for more than 10 years, according to the American Kennel Club. Labradors are people-oriented dogs, always ready for a jog around the neighborhood, a strenuous hike or an endless game of fetch. Labrador Retrievers live in generally 10-12 years. They have relatively few health problems, but are prone to hip and elbow dysplasia, ear infections and eye disorders. Labrador Retriever was bred to be both a friendly companion and a useful working dog. Labrador Retriever is a strongly built, medium-sized, short-coupled, dog possessing a sound, athletic, well-balanced conformation that enables it to function as a retrieving gun dog. Labrador Retrievers were bred for physically demanding jobs, and they have the high energy that goes along with being a working breed . They need at least 30 to 60 minutes of exercise a day. Even non-dog people can recognize a Labrador, and artists and photographers have captured his image countless times. True Labrador Retriever temperament is as much a hallmark of the breed as the “otter” tail. The ideal disposition is one of a kindly, outgoing, tractable nature; eager to please and non-aggressive towards man or animal.